The Fed delivered more than expected, with the big gains in pro-risk evidence that it wasn’t all priced in. Some key differences to prior: (i) QE delivered at market highs rather than lows (ii) Fed commitment to be accomodative even after recovery is entrenched (iii) specific targetting of improving jobs situation (iv) open ended (v) negligible rates out to 2015. 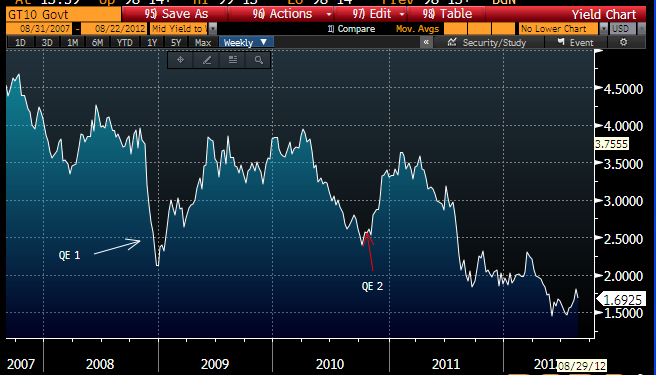 With ECB bond buying and Fed QE, pro-risk has some key support going forward. Stock market breadth improved. 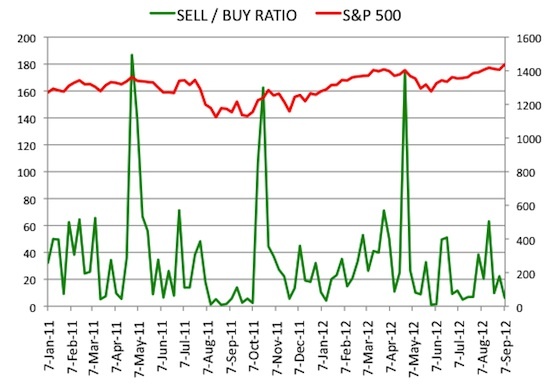 Corporate insider buying/selling is at a level more consistent with market bottoms than tops. Sentimentrader’s research post yesterday’s session suggests a consolidation may come to pass over the next couple of weeks before further gains. This fits with my own take. Technical breakouts in assets together with double QE (Europe and USA) are bullish, but overbought and overbullish indicators are to be respected. A consolidation over the next 2 weeks, the period into the next full moon, to relieve those indicators whilst maintaining the technical breakouts, would make sense. My account is currently 30% up for the year, now on track for my 40% target. Clearly I am delighted with that and don’t want to jeopardise the gains, particularly as the bulk of the positions are open. But I don’t find reasons to pare back positions currently. The biggest risk remains global leading indicators. Yesterday CB produced the latest data for Korea which came in at zero, a 3 month high (which Japan and UK also managed). Today Spain came in at -0.6 (following -0.3 last month and -0.6 the month before). So Spain still weak, but some potential positive trends elsewhere. We need more data, over more time, to assess. But with regard to my forecasts of an overthrow in stocks to end their cyclical bear (accompanied by increasing inflation and treasury yields), and then a parabolic finale in commodities and inflation, I see an increasingly supportive picture. Euro debt settling down, economic surprises repaired, 6 months of rate cuts across the world by central banks, US and ECB QE, technical breakouts in stocks and precious metals, inverse H&S on treasury yields and probability of fulfillment, US dollar breakdown, and recent new highs in grains to deliver food price inflation as of Q4 2012. Weakness in leading indicators does not offset all this. Don’t know man. I’m not as confident as you are that this house of cards holds together too much longer, much less that we see worthwhile gains that justify the risk. I’m thinking the greater fools this time around are those thinking there are still some greater fools around to carry the bag. These breakouts are looking more and more suspect to me. I’d give it a 50/50 possibility that this turns out to be a bull trap all the way around, a solid sell-the-news event. But like I said to start with, I don’t know. Just a probability analysis game at this point. As you say, we need more data. I’ll be posting a lengthy commentary this weekend expanding on these thoughts. The Nas and the SP500 both broke out a week ago, then pulled back to the breakout, made a successful retest and then advanced again. That’s usually a pretty bullish formula. There are several fresh breakouts on other assets that have greater potential for any reversal and they will need to make a couple of closes above to make solid. We’ll know soon enough – if this is a big bull trap then a reversal will have to happen next week. Let me know when your post is up. The pattern is relatively huge, and I’m not sure if a big bull trap reversal of this magnitude would be limited to a week . . . that is if it were to turn out to be one . . .
Just saw your new post as well. Heading out of the house now and won’t be back until late tonight. Will read it tomorrow. Best regards. Thanks High Rev, have read your post. All those charts to me say breakout. Triangles resolving to the upside, or resistances broken through. Your big wedge pattern too. My expectation is for an overthrow final phase to the cyclical stocks bull, based on history. If that lasted a couple of months from here and then reversed down, that could still make your large wedge ‘fakeout’ valid. But it would make a big difference whether to be long or short now of course. No, I’m not recommending, wait, I don’t “recommend” anything to begin with, so let me say suggesting, that short positions are a good idea at this point. 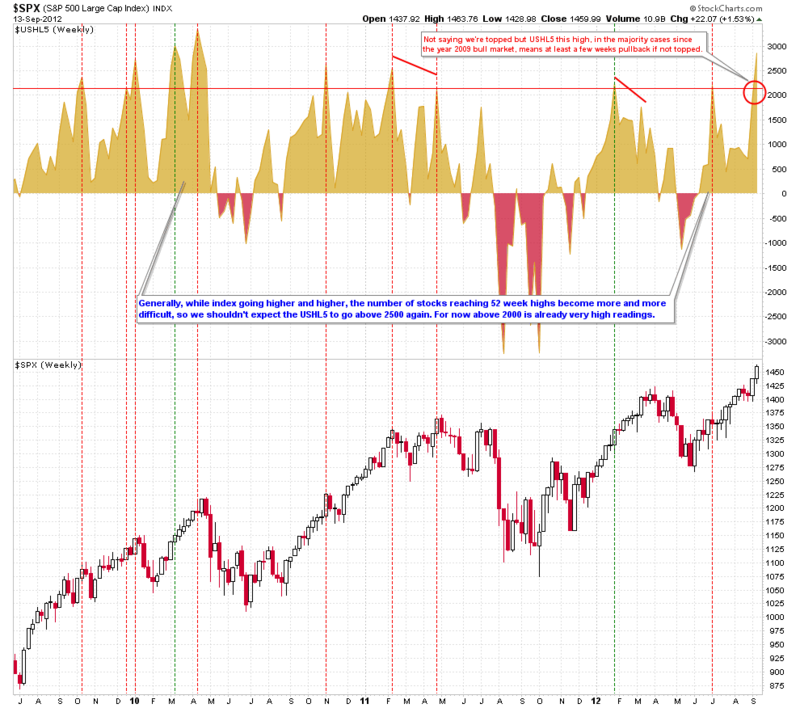 My analysis suggests that risk/reward on the long side is very high, and that new longs are probably not a good idea. My analysis suggests that the best idea is profit taking on longs previously established, and it also implies that trailing stop loss levels be raised accordingly on longs still open. Long liquidation, not short initiation. Scaling out longs now, and nothing about scaling in shorts. All based on probabilities given the current technical situation (I would actually put the lowest probability for successful intermediate term trades right now on swing shorting!). Very poor risk/reward for both new longs and shorts in my opinion at this point, and a great time to take profits, and perhaps sell time premium, but now I’m beginning to just repeat myself. But I can’t stress enough the difference between long liquidation and shorting! They are worlds apart! I hoped that the differences would be implicit by leaving my post void of the idea of shorting, and purposefully not even mentioning long liquidation, and strictly limiting my conclusions to saying that this is probably not the best of times to initiate NEW longs (with a “perhaps” caveat with the SSEC). There’s a big difference, and I wouldn’t want anyone to think that I was reading things any other way. Apparently I’ll need to be more explicit in the future. Thanks for your comments and impressions. It’s important to have critical feedback in order to learn from your mistakes. In the future I’ll need to be even clearer with regards to those distinctions just mentioned above. I also agree with you that the charts posted say BREAKOUT! That’s undeniable. However, what my analysis puts into question is the *kind* of breakout we’re seeing, and the *basis* from which it comes. I don’t like to see breakouts coming at trading extremes with indications of exhaustion. I prefer to see them coming on strength, and out of strong market structure consolidations and/or basing patterns, or at least something that lay more towards that end of the spectrum than the current overbought readings we’re seeing. Breakout on overbought? Yeah, they can run, but the probabilities of higher prices are much lower than breakouts on strength. Now if we were well above breakout levels, and trending, then I would be more comfortable with BOSO strategies (short term) http://premium.working-money.com/wm/display.asp?art=601 , but coming coincident with the breakouts makes me suspect those same breakouts. I’m also a contrarian at heart, so . . . Thanks again for reading and sharing your thoughts! They’re highly regarded and most appreciated. Some of these currencies put in nasty daily bars. The NZD, AUD, and CAD to be specific. While I am an uber bear long-term on the US dollar, I find it funny how many people think other Central Banks around the world are just going to sit on their hands and allow their currencies to appreciate relative to the US dollar. 2010/ 11 was only the beginning of a currency war. No reason to believe this won’t continue. Just another round fired from the Fed’s gun. Who is up next? I have so far been wrong on equities and right on commodities (more right than wrong). I’ll stay with this approach for now. As stated and won’t change until I see real value in equities as they are overdone massively thanks to the Fed’s actions since the dawn of the rally. While I have missed almost all of the upside in equities, I’d rather wait for my chance to capture the gold when fundamentals return to the markets, which in due time they will. On the other end, I have been acquiring commodities and reaping gains from that standpoint. I look at gold and silver as many do – a central bank put. So long as central banks do what they do best (devalue currencies), I’ll stick with one of histories oldest forms of currency. More money printing = more visits to my local coin shop. I will be more focused on the recent development in these commodity currencies however. I am interested to see how, in the long run, a continued devalued dollar will translate to the Canadian economy. A chart of the exchange rate of the US dollar/ Canadian dollar overlaid on a chart of the Canadian balance of trade is almost a mirror image since 1972. Even though it has been much of Canada’s rising imports and stagnant exports that have caused them some recent trade deficits, this won’t be sustainable for too long in my opinion. I believe the CAD is roughly 2500 pips (.25) or so overvalued. Canada’s exports tracks very well with its stock market. In a situation where the US dollar continues its slide thanks to QE3, or OEQE, or QE-infinity, or whatever you wish to call it, naturally the CAD would appreciate and therefore hurt CAD exports, thus there stock market. I don’t think the BoC is going to have any of this. I suspect that they will lower interest rates should this occur and have their own currency devaluation programs. I said at the beginning of the year that the Central Banks that act the slowest to currency devaluation from their largest trading partners will then be the one’s with the most drastic measures to play “catch up”, in particular those who are net exporters in a slower global economy. I still believe this will be the case. It’s not going to happen overnight, but as the currency wars heat up, I suspect we will see it sooner than later. I took 90% of my profits and became net short by the end of the trading day. Wow!! Take a look at $USHL5 (weekly) and $NYHL. The mother of all greed. Correction is dead ahead. Are there anything new under the sun? Thanks guys. A quick Saturday morning post coming up to have a look at some of these indicators following Friday’s session. Nice post. Agree.. Short term overbought, if you are nimble can play the downside for a week or so, BUT remember trend is up, so best bet is buy the dips. Things like DAX and FTSE are at key levels, resistance, so a pause to be expected, but longer term charts still showing UP.